It was always believed that the 2017 Spider-Man reboot would feature at least one or more characters from the MCU. Now, producer and Marvel head honcho Kevin Feige has confirmed this as fact. Though, he isn't specifying who, exactly, we'll get to see on the big screen alongside the web-slinger next summer. But he makes it clear that Peter Parker will probably also show up in several other Marvel and Disney releases. "He is in the universe now, and the fun of the universe is that characters go back and forth." As you've probably heard, Tom Holland's new take on the iconic Spider-Man will first be introduced as part of Team Iron Man in this summer's Captain America: Civil War. It was recently revealed that Sony had secured the URL domain name Spider-Man: Homecoming. This is the same title of a story arc in the Marvel comic books that includes cameo appearances from Tony Stark and Steve Rogers. Though, some believe those two characters aren't showing back up on the big screen until Avengers: Infinity War Part I.
Sony secured three other possible titles for the Spider-Man reboot, though it hasn't been officially announced what the actual title will be. In the comic books, Peter Parker has mingled with nearly every single existing character, so an appearance by just about anyone is possible. 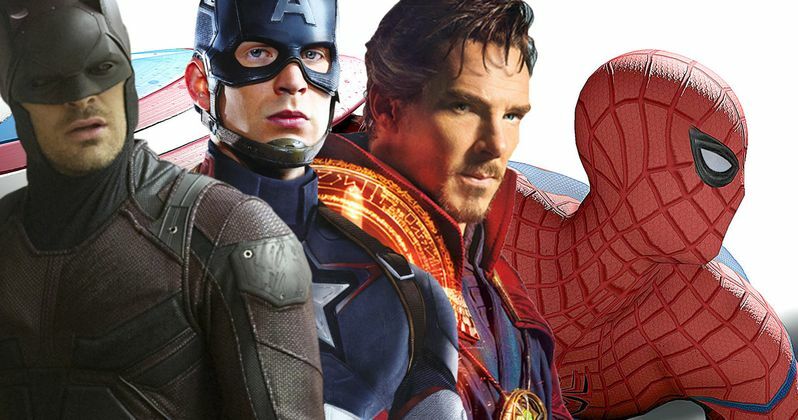 The reason why Spider-Man and his amazing friends haven't ever been seen on screen before is because, before Marvel started financing its own interlocking series of movies through their own studio, the licenses to several iconic superheroes had been sold off to various other studios around Hollywood. While Marvel managed to get a big chunk of their most popular characters back under the Disney roof, 20th Century Fox still owns the distribution rights to X-Men, Fantastic Four and Deadpool. Sony has everything associated with Spider-Man and his stable of friends. And it was only through a unique collaboration between Sony, Disney and Marvel that Peter Parker is even allowed to have a presence in Captain America: Civil War. That agreement stipulates that Sony gets to use any Marvel characters of its choosing in launching a new Spider-Man franchise. Sony shared its Spider-Man license with Marvel to get a deadline extension on using the character after The Amazing Spider-Man 2 proved to be a big disappointment for the studio. This gave Sony time to put together an all-new reboot for 2017. And it allowed Captain America: Civil War to utilize a character that was important to this particular story arc in the comic books. While none of the participating parties can tell us who will be in the Jon Watts directed Spider-Man, Civil War director Joe Russo did offer this tantalizing hint. "Let's just say ... Great Lakes Avengers." Of course, he's joking. So, who do you want to see fight alongside Spider-Man in his upcoming solo adventure? While Iron Man and Captain America are the popular choices, there has been speculation that Daredevil or Doctor Strange, who both live close to Peter Parker in New York, might be the ones to make a sudden, unexpected appearance.